Everyone deserves a great love story, but for 17-year-old Simon Spier, it’s a little more complicated. He hasn’t told his family or friends that he’s gay, and he doesn’t know the identity of the anonymous classmate that he’s fallen for online. Resolving both issues proves hilarious, terrifying and life-changing. Love Simon is a modern coming of age story that this generation needs. Carpooling to school every day, getting iced coffee from a drive through every morning, and finding a parking spot in the front of school is definitely not at reality for most, but the story is. The cast itself is not something to bat an eye at. It is an ethnically diverse group who range from the top jock to the drama club to the weird Vice Principal. You will find yourself encaptured in their lives, each telling a different story. Coming out as gay or any sexuality rather than straight is a reality that many people face, and it is not an easy one for many. This movie sheds light on a hush hush topic that is very common in today’s society. However, many do not ever experience a coming out. 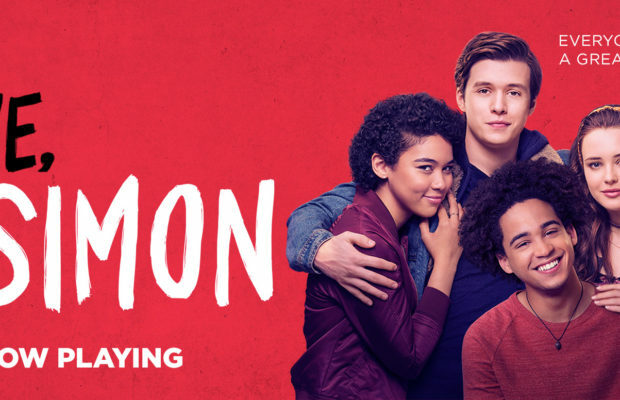 Even if you do not directly relate to Simon’s struggles, it can give you a better idea of what people go through when coming out. If you may not directly relate to Simon’s story, you will be drawn in by the great music, comedy, and the other characters storylines. The soundtrack includes artists such as The Bleachers, Khalid, The 1975, and Troye Sivan. You will find yourself bobbing your head to the tunes soon after the movie, another piece that makes Love Simon so powerful. The story itself is based off of Simon and his struggles, but it also tells the story of his closest friends and how his secret has affected them as well. Love Simon is such a feel-good movie. When walking out of the theatre you will feel many emotions, along with a feeling of understanding. This movie is so impactful and will help so many people understand and build up the courage to come out to families and friends. It has a power to influence many people, and we need to embrace that. Wracking up $43 million in the box office this past month, Love Simon is a must see for all genders, ages, and sexualities.